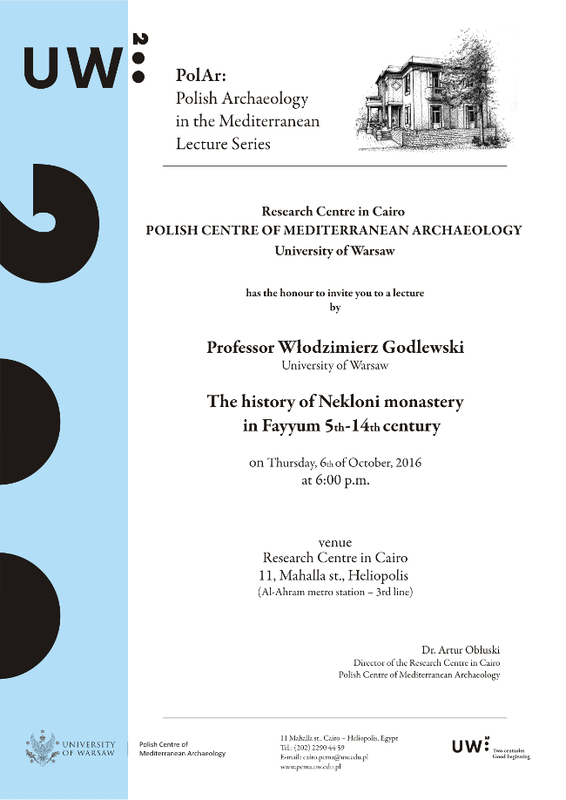 "The history of Nekloni monastery in Fayyum 5th-14th century"
Prof. Włodzimierz Godlewski is a professor at the Institute of Archaeology, University of Warsaw. He is also director of two archaeological expeditions of the Polish Centre of Mediterranean Archaeology, University of Warsaw to Old Dongola in Sudan and Nekloni monastery in Fayum, Egypt. His main area of expertise is the medieval period in the Nile Valley. The lecture presents one of professor Godlewski’s lifetime achievements: results of over 30 years of excavations of the Nekloni monastic complex in the Fayum oasis. The archaeological fieldwork brought up remarkable discoveries such as a dossier of legal documents, a piece of the now lost XI book of Livy’s “History of Rome”, and a hoard of golden Fatimid coins. Professor Godlewski will deliver us a historical outline of the monastic community flourishing for over a millennium on the outskirts of the oasis.